Medical assistants take direction from physicians while performing clinical and administrative duties, usually within an office or hospital. They may schedule appointments, help with billing, perform insurance coding, and maintain medical records. Recording medical histories, taking vital signs, drawing blood, administering medications, and preparing patients for their examinations are some clinical duties a medical assistant may perform. Medical assistant duties vary and are often determined by the specialty of the practitioner and the size and location of the practice. 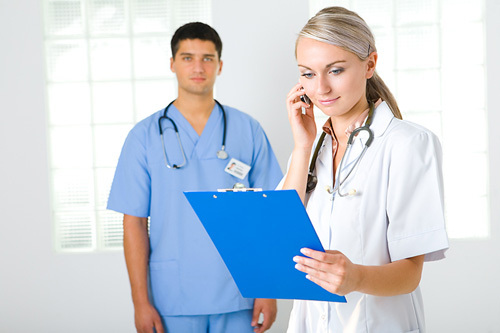 Take our Medical Assistant career assessment. This 30 question quiz let’s you know if you’re cut out for a career in medical assisting by analyzing your abilities, skills, and interests. 1. Does the idea of recording patients' medical history, vital statistics, or test results in medical records sound interesting to you? 2. Would you be OK preparing rooms for patient examination including cleaning them? 3. Can you interview patients and measure their vital signs along with height and weight? 4. Could you prepare and administer medications when directed to do so by a physician? 5. Does the idea of collecting blood, tissue, or other samples sound OK to you? 6. Are you up to the task of meeting or exceeding customers/clients needs? 7. Are you interested in gaining knowledge on medicine and dentistry? 8. Do you have knowledge of the structure of the English language including the spelling of words and grammar? 9. Are you OK using word processing software and managing files and records? 10. Do you have knowledge of human behavior and performance? 11. Can you convey information effectively? 12. Can you give your full attention to what others are saying? 13. Do you have the ability to understand written sentences in work related documents? 14. Are you aware of others' reactions and why they react the way they do? 15. Can you effectively monitor and assess your performance as well as the performance of other individuals or organizations? 16. Do you have the ability to listen and understand information giving to you through spoken words and sentences? 17. Do you have the ability to communicate information in speaking so others will understand? 18. Do you have the ability to know when something is wrong or is likely to go wrong? 19. Do you have the ability to read and understand what you have just read? 20. Do you have the ability to see details at close range? 21. Do you like the idea of providing personal assistance to others? 22. Does the idea of entering information in written or electronic form sound appealing? 23. Are you OK getting and receiving information from all relevant sources? 24. Are you OK providing information to supervisors and other individuals? 25. Can you use computers to enter data and process information? 26. Are you alright with near to constant contact with others? 27. Can you work well within a group or team? 28. Do you have the ability to be exact and highly accurate in the performance of tasks? 29. Are you OK having telephone conversations nearly every day? 30. Can you handle being very close (near to touching) or within reach to various people as you perform your tasks? According to the U.S. Bureau of Labor Statistics, medical assisting is currently one of the most in-demand professions in the country. If you have excellent organizational skills and enjoy working in a medical setting such as a hospital or physician’s office, a career as a medical assistant may be a perfect fit. is the average earnings for medical assistants per year. have a post-secondary certificate while 18% have an Associate’s degree. Medical assistants typically have earned a high school diploma and completed a training program of either one or two years. While formal training is normally preferred, some medical assistants are trained on the job. If you choose to attend a medical assisting program, you will receive instruction in anatomy, biology, and physiology, as well as various administrative courses and instruction on how to use different types of medical equipment. Medical assistants are currently in high demand. According to the Bureau of Labor Statistics, medical assisting careers are expected to grow by 23% between 2014 and 2024, which is much faster than average. Therefore job prospects in this field are excellent. Most medical assistants earn an average of $30,590 per year; however, this figure varies depending on the type and location of the practice. The lowest 10 percent earned less than $22,040, and the highest 10 percent earned more than $43,880 per year. Medical assisting may consist of both administrative and clinical tasks. In addition to maintaining patient files, taking medical histories, submitting insurance claims, and arranging appointments and medical procedures, medical assistants often prepare patients for examination, assist during exams, and prepare lab samples. These tasks typically vary from one office setting to another, depending on the size and type of practice. Find out the most common medical assisting work activities and more in the table below.